Underwater devices that need portable power, like those used for data logging or to measure conductiv- ity, temperature and depth, face signi? cant challenges. Non-Rechargeable two degrees Celsius. It features a scal- cost to portable power consumables. Min. Temperature: 35.6°F in energy output ? exibility from 360 to pressure tolerance in the ? eld of battery design. Devel- 900 Watt-hours (Wh). 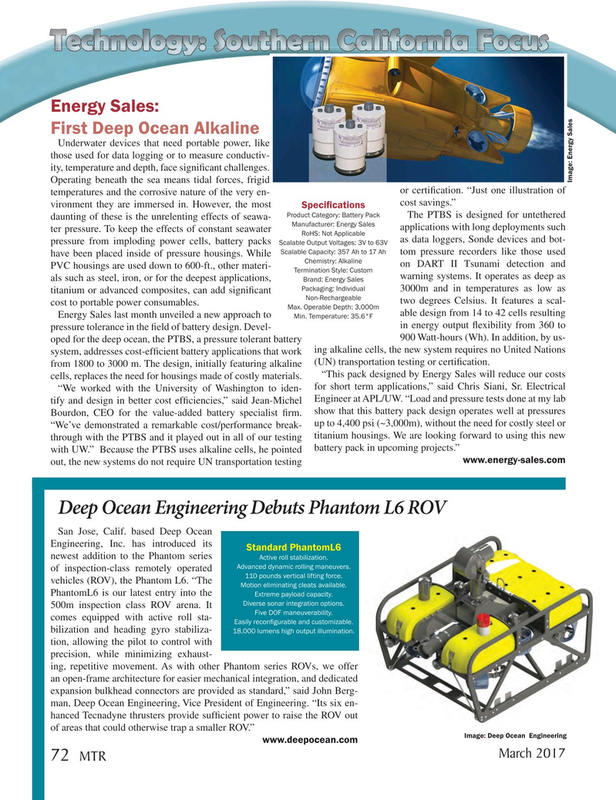 In addition, by us- oped for the deep ocean, the PTBS, a pressure tolerant battery system, addresses cost-ef? cient battery applications that work ing alkaline cells, the new system requires no United Nations from 1800 to 3000 m. The design, initially featuring alkaline (UN) transportation testing or certi? cation. “This pack designed by Energy Sales will reduce our costs cells, replaces the need for housings made of costly materials. of inspection-class remotely operated 110 pounds vertical lifting force. Easily recon? gurable and customizable. bilization and heading gyro stabiliza- 18,000 lumens high output illumination.